I hope the new year will bring you good luck and happiness. This is my new year's card. 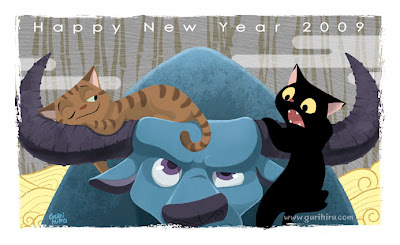 2009 is the year of the Ox in Chinese Zodiac. The model is a two cats that I have. really cute cats :) Happy New Year to you! This week I bought Wolverine Power Pack #3- the cover is fantastic! I was surprised to open the book later and not find your drawings inside- did you draw #4? Happy New Year! Very cute picture.